The Holy Grail has been the national symbol of the Kingdom of Galicia for almost a millennium. 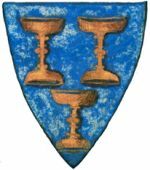 The earliest notice of the Holy Grail appearing as the arms of the kings of Galyce comes from an English armorial dated on the 13th century. 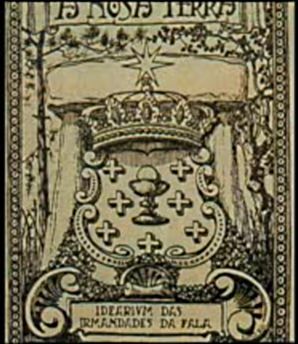 The way the Holy Grail was depicted as the national symbol of Galicia has changed constantly over the past eight centuries. Originally, the Holy Grail appeared as a single golden chalice centered over a blue field, with no crosses around it. Later on during the 16th century crosses and angels were added around the Grail for decorative purposes, and new red-fielded and white-fielded flags were created for military and naval purposes. 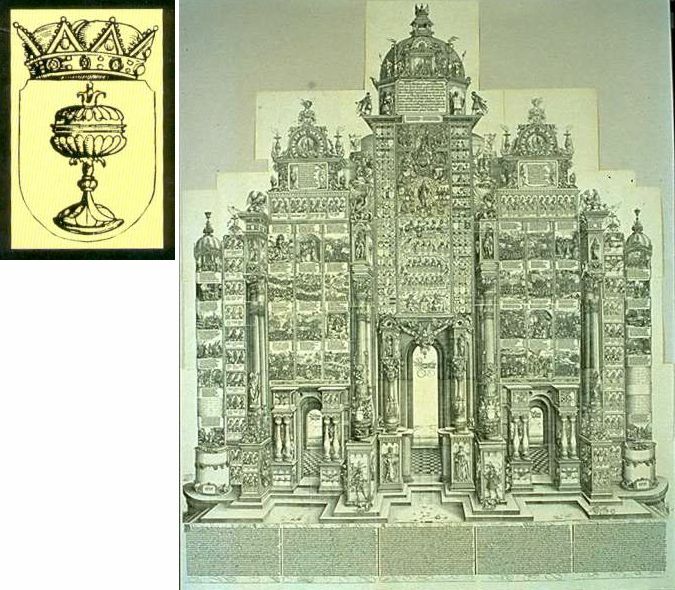 The contemporary design of the Holy Grail of Galicia was standardised in 1972 by the Royal Academy of Galicia. The Holy Grail appears as the arms of the kings of Galicia in the Segar's Roll, an armorial compiled in England circa 1282. This early representation features the arms of the kings of Galyce as three golden Grails over an azure field, set in a similar manner as to the later arms of the kings of Sweden. 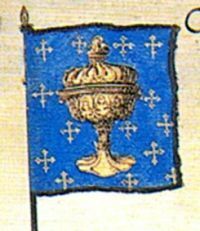 Soon after, in the Armorial du Hérault Vermandois compiled in France between 1285 and 1300, the Holy Grail of Galicia is depicted as a single golden chalice over a blue field with the following description: "Le Roy de Galice, dasur a ung galice dor couvert en magniere dune couppe Azure a covered cup or". The golden chalice over a blue field became the standard representation of the Holy Grail of Galicia during the 15th century. 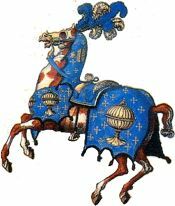 As such, it appears under the name Galiscién in a very comprehensive armorial made in Sweden in 1436 called Codex Bergshammar, and also in the Armorial Gymnich from Flanders, compiled circa 1445. 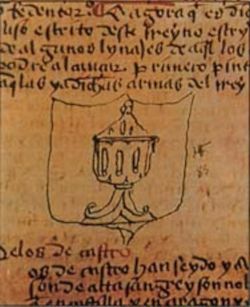 Written towards the end of the 15th century, the Holy Grail appears again in a manuscript description of the Kingdom of Galicia found in the library of the castilian monastery of 'El Escorial'. The Holy Grail as the arms of the Kingdom of Galicia appear as well during the 16th in the Arch of Triumph of European emperor Maximilian I von Habsburg, made in 1515 by the famous German painter Albrecht Dürer. 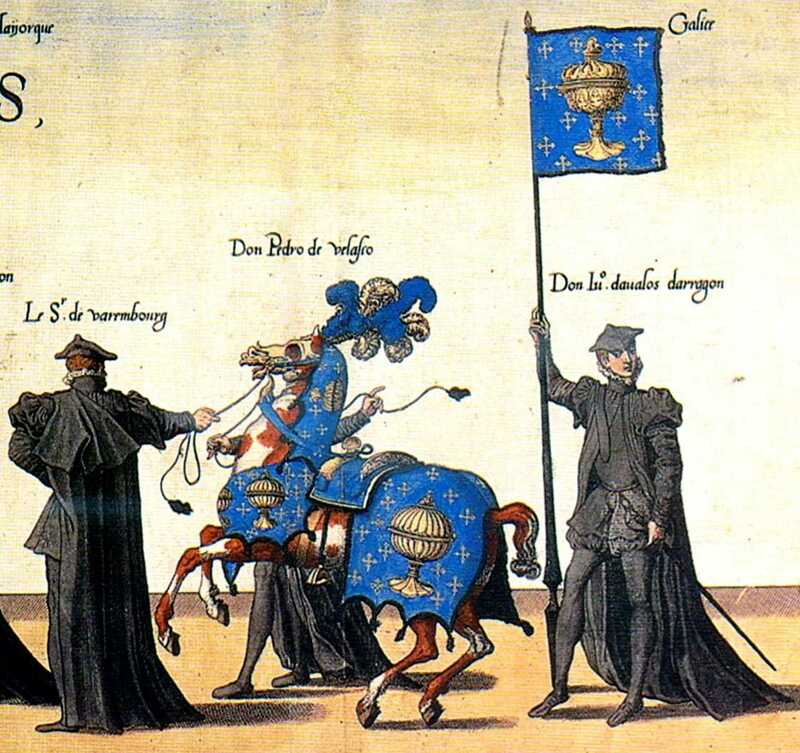 The arms and flag of the Kingdom of Galicia are also depicted in a beautiful canvas painted in 1559 to commemorate the funeral of European emperor Charles V. The painting shows a knight holding the flag of Galicia as a golden Holy Grail surrounded by crosses over a blue field. 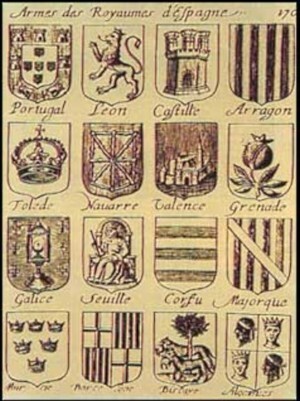 The arms of Galicia were painted in a similar way in a heraldry book written around 1581 in Lyon, France. 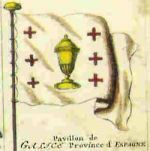 The golden Holy Grail surrounded by six crosses, three on each side of the chalice, became the standard representation of the Arms of Galicia during the 17th century. 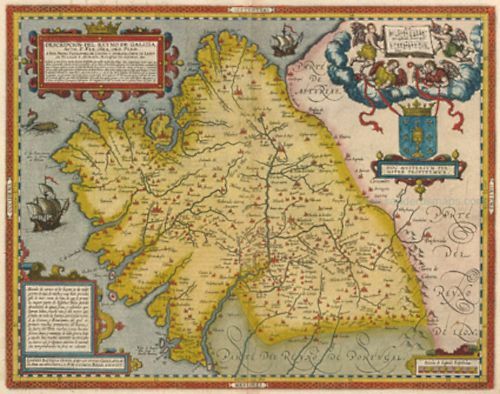 The Holy Grail of Galicia was painted this way on the map "Gallaecia Regnum" (Kingdom of Galicia) made in 1598 by Galician monk Fernando Ojea, and in a similar map made some years later by Flemish cartographer Abraham Ortelius. 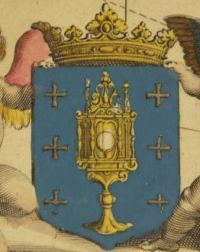 The Grail surrounded by six crosses appeared also in an engraving of the coat of arms of the kingdoms of Spain made in 1663 by French geographer Nolin. 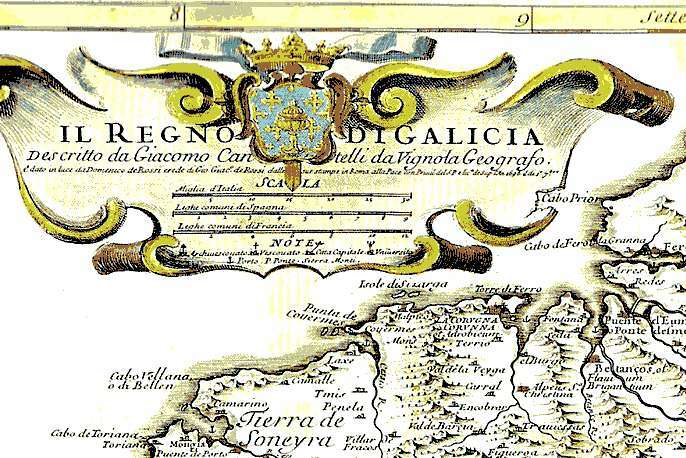 It seems however this may have been a slow standardising process as there are also other examples where artists decided to paint the Holy Grail of Galicia following previous standards used in the 16th or 15th century, for example Italian cartographer Giacomo Cantelli in his 1696 map Regno di Galicia. 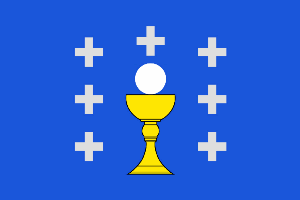 While the 6 crosses (three on each side of the chalice) became the standard Galician flag for almost two centuries, a 7th cross emerged eventually on top of the Grail. That 7th cross came from the top of the chalice, whose lid was ending in the shape of a cross, and joined independently the rest of the crosses over the field of the flag. Some contemporary authors have speculated whether the number of 7 crosses used to accompany the Holy Grail might have been chosen to symbolise the seven major cities of the Kingdom of Galicia. Such a theory is unfounded and lacks historical rigor. The crosses were just born to decorate the empty space around the Grail and evolved in a random number since the 16th century. In 1571 the Kingdom of Galicia sent a fleet to fight in the Battle of Lepanto against the Turks. The Galician Navy flew her own flag, which consisted of the Holy Grail surrounded by one angel on each side, over a red field. 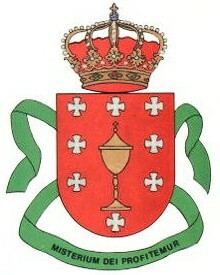 Almost two centuries later we find again the Grail over a red field in a military context as the Arms of the Regiment Galicia. This Galician regiment can be traced back to the Lombardy Troops in 1534, and has fought in wars in Scotland (allied with the Jacobites), Savoy, Piedmont, Argentina, Spain and France. 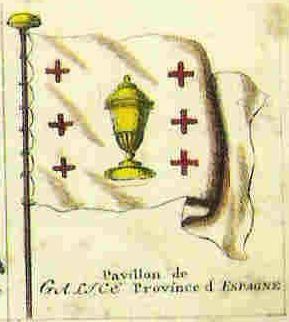 The current flag of Mondoñedo, which also displays a golden Grail over a red field, is heir to a similar Galician military flag carried by the Mondoñedo Provincial Regiment during the 18th century. 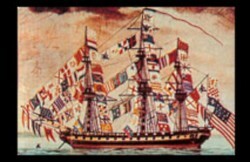 white flag appeared again in a naval context, flown by a USA frigate at the end of the 18th century. 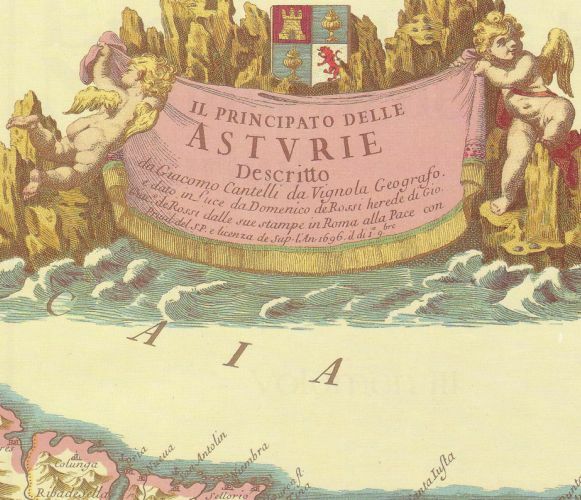 The apparently widespread use of the white flag during the 18th century provoked confusion among several 19th century writers who adopted the white naval flag as the National Galician flag, ignoring that the historical flag of the Kingdom of Galicia had actually a blue field, not white. The 19th century was a period of yet even more political and economic decadence for the Kingdom of Galicia. Much as with Ireland, almost half of the Galician population left to the Americas fleeing from poverty. The Galician cultural renaissance of the 19th century was mainly supported and financed by the Galician exiles. During this century Galicians in the New World adopted the Corunna Saltire as the modern national flag of Galicia. 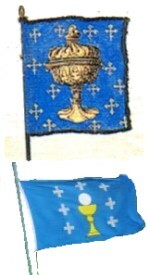 From here onwards, the Holy Grail of Galicia would not be used as a flag, but strictly as a Coat of Arms. 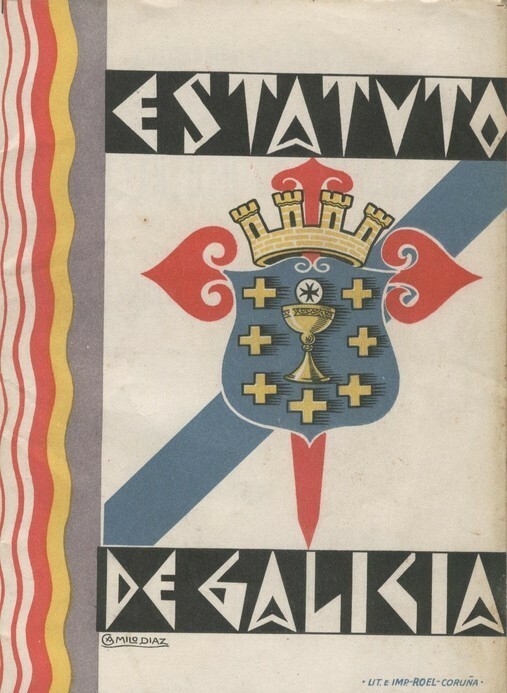 Early in the 20th century, the Archivist of the Royal Academy of Galicia, Mr. Cesar Vaamonde, felt the need to remind Galician intellectuals that "The traditional colours of the Arms of Galicia are golden chalice and blue field. There are however some authors who are still depicting the national arms in a different manner". In the same article, published in the Bulletin of the Academy, he also complained that the historical flag of Galicia "is currently being substituted by the Saltire of Corunna". Historical studies in Galicia were at that time just beginning and confusion about the history of the Galician arms was widespread. The situation was highlighted in 1937 by the leader of the Galician National Party, Mr Afonso Castelao, who wrote: "I remember people discussing about how the historical Galician flag looked like, and nobody being able to be completely sure about her true colours. Only few of us knew that our historical national flag was not the white flag". 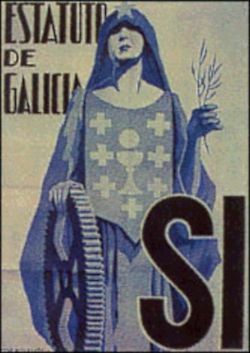 Some members of the Galician National Party tried to bring the Grail back into the spotlight as the genuine national symbol of Galicia, yet the Saltire of Corunna had become too widespread in the Galician society. Moreover, Franco's coup d'état and his subsequent dictatorship halted for half a century the Galician cultural revival. 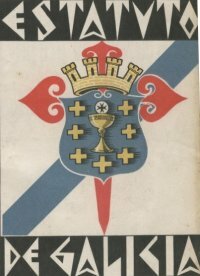 After the Franco dictatorship, the Royal Academy of Galicia standardised the desing of the Holy Grail of Galicia and asked the Galician Government to officialise the historical arms of the nation. The Galician Government decided to merge the modern national flag and the historical arms of Galicia into what is called the 'Galician State Flag'. The State Flag, which features the Holy Grail of Galicia over the modern national flag, is the the official flag that must be flown in all institutional events by the national and local governments in Galicia, according to the Law 5/1984 of National Symbols of Galicia. "The National Flag of Galicia shall display the official Coat of Arms when flown on public buildings and institutional events in Galicia"
Law 5/1984 of Symbols of Galicia, Article 2.2. 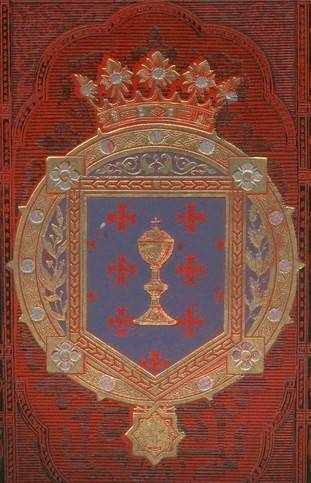 The Holy Grail has been the national symbol of the Kingdom of Galicia for almost a millennium. 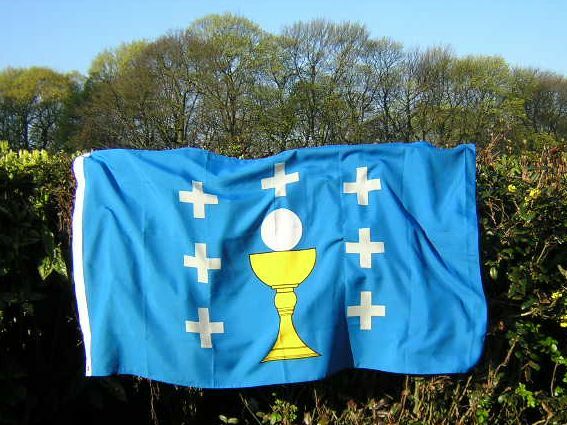 As part of this initiative for the historical banners and flags of Galicia, you can now have your flag of the Kingdom of Galicia featuring the Holy Grail and crosses as standardised by the Royal Academy of Galicia.